Remember when your biggest concern was covertly passing notes in the back of class? How many tater-tots the lunch lady gave you? How much glue to feed the class hamster? Five twenty-somethings find themselves sucker-punched by real life, and the result is School for Suckers, a new comedy opening at the Lillian Theatre on Tuesday, August 25 and running through September 30. All performances will be Tuesday and Wednesday nights at 8:00. The days of spitballs, hopscotch and playdough are over, suddenly replaced by awkward dates, religious conflict, and identity meltdowns. Five college grads have just enrolled in the toughest class of all … and nobody brought a pencil. Featuring witty original comedy mixed with real-life reflections, School for Suckers promises to be a unique theatrical experience. The show contains some profanity and adult themes. Parental discretion is advised. School for Suckers is written and will be performed by (in alphabetical order) Sascha Alexander, John Dardenne, Ben Giroux, James Robinson, and Juliana Tyson. The cast of five, along with director Elissa Weinzimmer, are all graduates of USC. 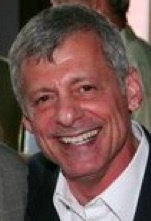 Dan O’Brien will design lighting and Julianne Figueroa is the stage manager. Opening night is set for Tuesday, August 25 at 8:00. The regular performance schedule is Tuesday and Wednesday at 8pm through September 30. THE MEDIA IS INVITED TO ATTEND OPENING NIGHT ON TUESDAY 8/25, AND IS ALSO WELCOME AT ANY OTHER PERFORMANCE. All seats are $15, and tickets may be purchased by calling (323) 960-7822 or reserve online: www.plays411.com/schoolforsuckers. 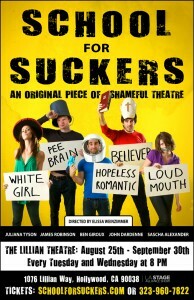 For more information on the show’s cast and creative team, visit www.schoolforsuckers.com. The Lillian Theatre (home of the critically acclaimed Elephant Theatre Company) is located at 1076 Lillian Way (off Santa Monica Boulevard, just west of Vine), in Hollywood. Street parking is available.